Gold is the most traditional of metals for jewellery; popular for being low maintenance and high quality. When creating gold bespoke jewellery, you will find that it is easy to work with and to resize. With a range of gold tones to choose from, it can be a very versatile metal to design. Plus, you can cherish it for the long term as it is resistant to rusting, tarnishing and oxidation. Yellow Gold symbolises fidelity and is therefore a popular choice for traditional style wedding jewellery. Being yellow toned also helps it to complement warmer skin tones and stand out on darker skin tones. White Gold is the modern and most glamorous alternative. Being a symbol of friendship, many people choose white gold for promise rings and engagement rings. As well as being scratch and tarnish resistant, it is also very flattering on cooler skin tones. 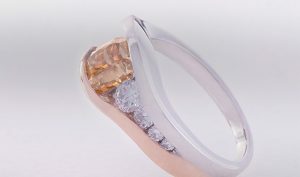 Rose Gold has enjoyed increased in popularity over the years for its feminine and vintage edge. Symbolising love makes it perfect for sentimental jewellery and the pink hues compliments all skin tones. Green Gold is great if you are looking for something more unconventional. This naturally inspired metal blends gold and pure silver to create a gold with a stunning greenish tint. Despite being aesthetically similar to white gold, platinum and gold metals are different entirely. In fact, platinum is 30% rarer than gold, but both feature at similar price points. Also, despite being rust and tarnish resistant, platinum does require a bit more maintenance. Nevertheless, the cool white sheen of platinum jewellery doesn’t reflect colour, making it perfect for emphasising a diamond’s sparkle. It is also the most hypoallergenic of metals, for those with allergies to certain jewellery. Being lightweight and easy to mould, palladium is easier for jewellers to shape into intricate designs. Being strong, tarnish resistant and hypoallergenic are a few of its many other benefits. Not forgetting the little maintenance required to maintain its silver colour, which pairs well with diamonds and gemstones. Sterling Silver is the most affordable of metals but can also be one of the most versatile. Available in a shiny or matte finish, sterling silver is compatible with diamonds and most gemstone colours. Also, regular wear keeps it’s shine, making it ideal for bespoke jewellery intended for daily wear. At the Allen Brown Jewellery Gallery, we specialise in beautifully crafted commission pieces. Bespoke jewellery is the perfect choice when shopping for a loved one and can guarantee you a one of a kind. Give the gift of bespoke jewellery by visiting us at Heart of The Country Shopping Village or calling 01543 481948 today.